If you are in the Olympic sport of table tennis, then you know Danny Seemiller, USA’s greatest modern champion. 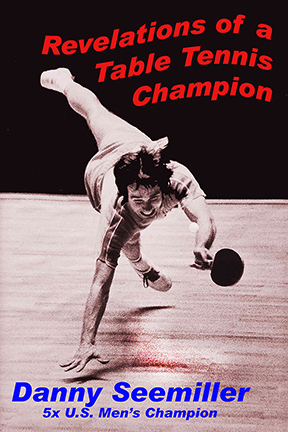 In “Revelations of a Table Tennis Champion,” the five-time U.S. Men’s Singles Champion takes you through his 50 years in the sport, from the early days of training, the breakthroughs, the agonizing defeats and the great triumphs. You’ll learn why the three-sport star – baseball, basketball, and football – changed his focus to table tennis. You’ll experience his trips around the world, from being marched at gunpoint to achieving his boyhood dream of defeating the Chinese. But playing is only half his story. Danny, a long-time coach first in Pittsburgh and then in South Bend, Indiana, was the U.S. Olympic and World Team Coach for ten years, and was named the USOC Coach of the Year for Table Tennis three times. He served five years as president of USA Table Tennis, ran dozens of major tournaments through the years, and was instrumental in bringing the 2018 World Veterans Games to the United States. He is a member of the USA Table Tennis Hall of Fame, and in 2012 became the youngest recipient of the Lifetime Achievement Award. Available at Amazon in paperback, $24.95, or ebook, $9.99. Dan is considered by most the greatest modern U.S. player, going back to the 1950s. He’s done it all at the highest levels – player, coach, tournament director, club president, and president of USA Table Tennis. He even has a grip named after him – the “Seemiller grip.” There’s a reason he was the youngest person ever awarded the USATT Lifetime Achievement Award, in 2012 at the age of 58. Even now, as I write this, he’s still actively playing – easily the best over 60 player in the U.S. – while coaching at South Bend and helping USA Table Tennis run training camps for their top juniors. Plus, he was instrumental to bringing the World Veteran Games to the U.S. in 2018, something he’s very excited about – setting it up, running it, and playing in it.